I recently purchased a number of the Burtonwood Brewery in-house ‘Top Hat’ magazines from the 1980s, in one of them was this article concerning the excavation of the Southworth Burial Mound which is between Winwick and Lowton. Remnants of a long-lost civilisation have been unearthed from plough-blade depth on open farmland, close to a huge man-made crater which will eventually accommodate colliery waste. And to mark the sensational discovery, being hailed as the North’s most important prehistoric find of the last decade, the archaeology team responsible decided to roll out the barrel with a big celebration party. They contacted Burtonwood Brewery, only about five miles from the big dig at Southworth Hall Farm … to put the ‘top hat’ on the historic achievement with a crate of beer. 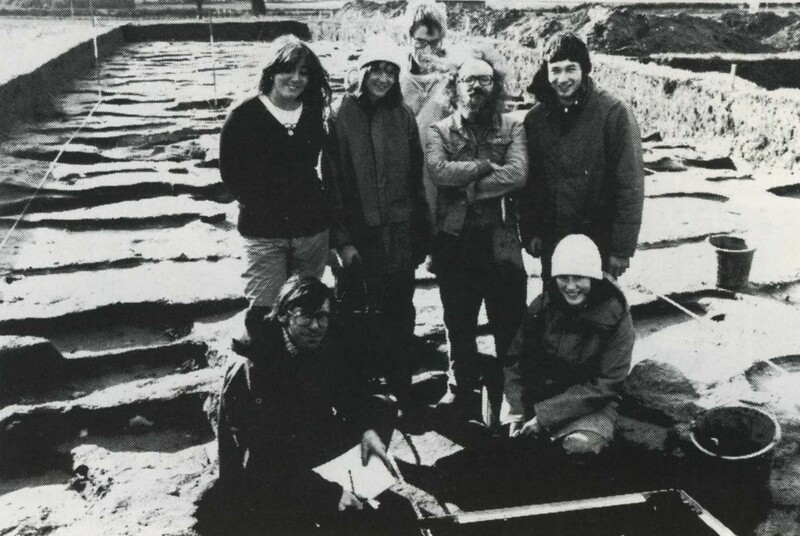 What the Liverpool University Rescue Archaeology Unit hit upon was a Bronze Age cemetery, dating back almost 4,000 years. They already knew that a burial mound existed on the land of Southworth Hall Farm. But they were totally unprepared for what the laborious seven-month dig would produce — the remains of eight cremations, together with three collared urns and ritual pottery cups. It measures about 14 inches high by a foot wide. Now the find is being scientifically examined. Already, David Freke estimates that they date back to between 1500 and 1800BC. The unit moved in when they were informed that the old burial mound would be swallowed up by the ever expanding chasm, about 50 to 60 ft. deep, from which stone is being quarried for use on motorway construction. As the massive bulldozers and crusher machines clatter away beside them, the unit, taking in volunteers from St. Helens, Newton and outlying districts, had been painstakingly at work. Miniature trowels, spoons and even tiny dentist’s picks have been employed to tackle their search for 4,000-year-old evidence. 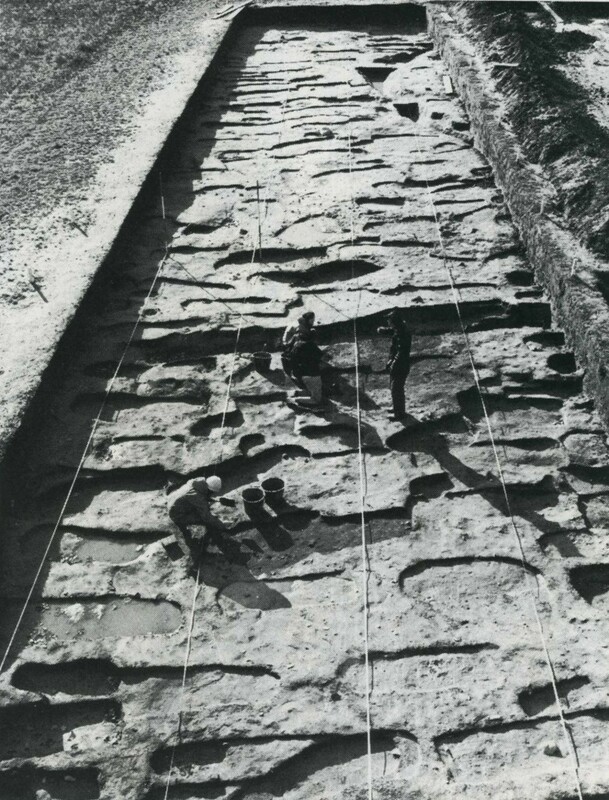 The team of diggers had put in an incredible 2,000-pius hours of laborious probing, picking and scratching in the 2ft deep rectangles, neatly sectioned off as clues to the past have been brought to light. It appears that the unit did not act a minute too soon. Said David: “We do know that one of the buried urns was struck by a plough, and bones scattered”. The scent of a huge onion field wafted across on a rainbringing wind that carried with it the drone of the nearby M6. But the team of men and girls, anoraked and swathed in winter woolies, stuck to the task, totally absorbed. The project had only two more days to run and they were keen not to leave a stone unturned before the bulldozers moved in to swallow up their unique piece of prehistoric. 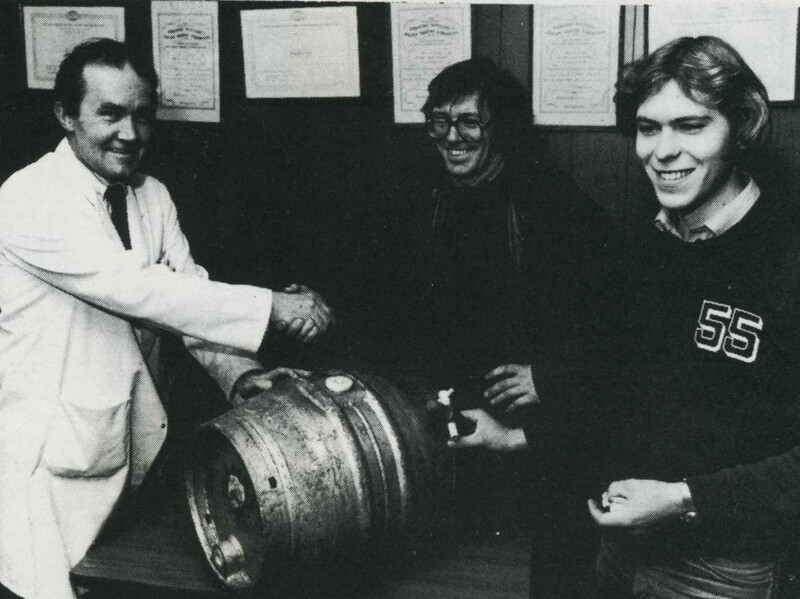 DAVID FREKE (centre) accepting congratulations and his celebratory firkin from Ian Bowden, the Brewery’s second brewer. Also in picture is Robin Holgate, of Liverpool University.